My 10-year-old son walked up to me the other day and said, "Mom, remember when we read that book about the four kids who go to that house for the summer and meet that boy?" Of course I remembered. He was referring to "The Penderwicks: A Summer Tale of Four Sisters, Two Rabbits, and a Very Interesting Boy" by Jeanne Birdsall. Two summers ago, I read it aloud to my kids several nights a week. I remember them fighting for positions next to me on my king size bed as they crowded around me while I read. My son continued, "Remember you said that there was another book about the Penderwicks? Do you think maybe we could read it this summer?" This coming from a kid who is way too cool of late to hug me, to tell me he loves me - such gestures are beneath his new maturity level. But when it comes to listening to me read, he still fights for prime position next to me. Guess who's heading out lickety-split to get the next book? 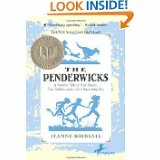 Actually, I found out that there are now two more Penderwick books: "The Penderwicks on Gardam Street" and "The Penderwicks at Point Mouette." The books are delightful, the time with kids huddled around me even more so. I don't experience great mom moments as often as I'd like, but summer reading with the kids is most definitely in that category. I can't wait. We really do read the same books... I'm about 1/4 into the newest Penderwicks right now. I adore these books. They appeal to both boys & girls! (not always easy to find) The sequels are as good as the first. I find the characters and the tone to the books so refreshing. Perfect summer reads! Love those Penderwicks! Funny how we both had it on the our minds. Our two summer read alouds (four my under seven crowd) were Black Beauty and Homer Price. Homer Price was SO funny. And the boys will quote or retell parts of it. Summers are made for good books! Glad to hear that you've got your big move behind you. I don't think there is an easy move. We're in the midst of it. Enjoy the new house!